Edna Imogene Bell Walker, age 96, died peacefully on Saturday morning, March 16, 2019, at Walnut Crossing Assisted Living in Marysville, OH, where she had resided since January 2018. She had been in failing health for several years. She was born December 19, 1922, in Coletown, TN, to the late Otto Pennelton Bell and Mary Ann “Kate” (Harper) Bell. Edna married Don H. Walker in 1946, and they enjoyed 62 years of marriage until his death on March 13, 2008. During their marriage, Edna and Don lived in many places as they traveled for Don’s work. Don retired in 1981, and they moved to Washington Court House, OH where their son, Ron, resided. Edna lived in Washington Court House until 2011, when she moved with her son, Ron and his wife Linda, to share their new home in Marysville, OH. In addition to her husband and parents, Edna was also preceded in death by one son, E. Jerry Walker, who died December 12, 2017, and by nine siblings. She is survived by her daughter, Brenda (Paul) Ghosh of Charleston, WV; son, Ronald (Linda) Walker of Marysville; grandchildren, Terrie (Alan) Harkless of Hilliard, Kendra (Grant) Reveal of Etna, Trudi White of Texas, Mitch (Rose) Saunders of Canal Winchester; Mike (Lisa) Walker of Johnsville, Don (Jennifer) Walker of West Liberty, WV and Sara (Rob) Meriweather and their sons, Jackson and Austin, of Plain City; 18 great grandchildren and four great great grandchildren. She is also survived by several nieces and nephews, as well as countless friends. Edna was actively involved in the local YMCA (Silver Sneakers program) and at her church during her years in Marysville. She enjoyed her friends and the special staff at Walnut Crossing Assisted Living, where she will be missed. A gifted quilter and wonderful cook, Edna spent her life loving and serving others. She made many beautiful quilts, most of which she gave away to family and friends. Edna was a woman of strong faith and she shared her gifts and talents in many capacities during her years in Washington Court House, where she was a member of Sugar Grove United Methodist Church. She joined the congregation of Jerome United Methodist Church in Plain City, OH, in 2011, where she served and worshiped faithfully until her death. Edna will be remembered as a loving mother, grandmother and friend. She had a great joy for life and she shared that joy with everyone around her. Her infectious smile and her frequent acts of kindness impacted many people. As a final act of selfless giving, Edna donated her body to The Ohio State University. A celebration of Edna’s life will be held on Saturday April 6, 2019, at 10:30 a.m., with lunch to follow, at Jerome United Methodist Church, 10531 Jerome Road, Plain City, OH 43064, with the Reverend David Bridgman and the Reverend Donna Montgomery officiating. During this time of sharing stories and memories of Edna, the family would like to see pictures of quilts that Edna made and gave to people over the years. Please take a picture to share or carry the quilt to the celebration. For those who cannot attend, pictures may be emailed to info@jeromechurch.org. Please include information about the quilt and the recipient(s). In lieu of flowers, donations may be made to Jerome United Methodist Church in Edna’s memory. Arrangements were made by Kirkpatrick Funeral Home in Washington Court House. Gladys L. Shoemaker, 101, of Washington Court House, Ohio died Monday, March 11, 2019, at 8:03 a.m. at Court House Manor where she had been residing since December 2016. Mrs. Shoemaker was born July 9, 1917, at Milledgeville in Fayette County, Ohio to Ward Lincoln and Grace Elizabeth Morgan Wilt. She was a graduate of Jeffersonville High School and received a bachelor’s degree in education from Wilmington College. She was a lifelong resident of this community. She began her teaching career at Sedalia in Madison County, then taught at Good Hope and later at the Washington Middle School and Washington High School. Mrs. Shoemaker was a member of the First Presbyterian Church and Alpha Delta chapter of Ohio State Organization of Delta Kappa Gamma Society International. She was an avid reader. On May 31, 1944, she married Joseph Harold Shoemaker. He preceded her in death on February 1, 2007. She was also preceded by a sister, Jane Foster in 2016, and a brother, Alan Wilt in 2018. She is survived by two daughters, Jo Hodous of Cincinnati and Julie Beth McGuff and her husband, Patrick, of Columbus, three grandchildren, Rory Hodous and his wife, Sarah, of Mason, OH, Katlin McGuff and her husband, David Fortunato, of Cincinnati and Kelsey McGuff of Westerville; a sister, Maxine Warner of Washington Court House and several nieces and nephews and great and great great nieces and nephews. The funeral will be Thursday, March 14, 2019, at 1:30 p.m. at the Kirkpatrick Funeral Home in Washington Court House with the Rev. Gray Marshall, pastor at the First Presbyterian Church, officiating. Burial will follow in the Milledgeville-Plymouth Cemetery. Friends may call at the funeral home from noon Thursday until time of the service. Memorial contributions may be made to the Carnegie Public Library, 127 South North Street, Washington C.H., Ohio 43160. Frieda E. Craig, 96, of Jeffersonville, Ohio, died Sunday, March 10, 2019, at 6:16 a.m. at Carriage Court Assisted Living where she had been residing since December 2017. Frieda was born July 25, 1922, in Madison County, Ohio to Warren and Grace Fultz Young. She was the last surviving member of the Wayne High School class of 1940, in Good Hope. She lived most of her life in Fayette County. She formerly been lunch room supervisor at Miami Trace High School. Frieda was a member of the Spring Grove United Methodist Church. She had been a member of the Washington Court House Chapter of the Daughters of the American Revolution; the former Pythian Sisters in Jeffersonville and was a longtime precinct judge for the Fayette County Board of Elections. She had been a 4-H advisor and loved quilting. On August 24, 1940, she married Richard Delwin Craig. He preceded her in death on October 7, 1996. She was also preceded by a son-in-law, Michael Cunningham in 2006, and a half sister, Janet Cline. She is survived by four children, Marsha and John Smith of Columbus; Theodore D. Craig and his wife, Judith, and Pam Cunningham, all of Washington Court House, and David W. Craig of Jeffersonville; five grandchildren, Teddy Craig and Bradley D. Craig and his wife, Maggie of Washington Court House, Brian Craig and his wife, Christina, of Fayetteville, Ohio, Jason E. Cunningham and Darren P. Cunningham, both of Grove City, Ohio; five great grandchildren, Audrey, Kaylee, Garrett, Kelby and Owen Craig and nieces and nephew, June Steiner, Jane Rohlfing and Tommy Cline. A graveside service will be held Wednesday, March 13, 2019, at 11 a.m. in the Fairview Cemetery in Jeffersonville with Mell Wickensimer, director of visitation at the Grace United Methodist Church and the Rev. Paul K. Zimmerman, retired United Methodist minister, officiating. Burial will be under the direction of the Kirkpatrick Funeral Home in Washington Court House. 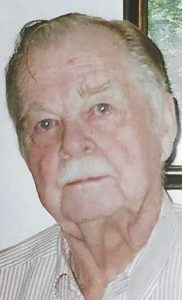 Ray Henry Jinks, 87, of Washington Court House, Ohio died Tuesday, March 5, 2019, at 7:19 p.m. at Kettering Medical Center where he had been a patient the past week. Ray was born August 17, 1931, in Washington Court House, Ohio to Ira Wayne and Opal Lavada Johnson Jinks. He was a 1949 graduate of Washington High School and was a lifelong resident of this community. He was a retired farmer and had been a supervisor for the Fayette Soil and Water Conservation District. Ray was a member of the Grace United Methodist Church where he served as an usher; Fayette Lodge F & A.M. #107 and the 32nd Degree Masons, Valley of Columbus. He was a veteran of the U.S. Army. He is survived by his wife, the former (Alice) Joyce Crone whom he married June 10,1955; three children, Wayne Alan Jinks, Debra Joyce and David McCoppin and Michael Ray and Heidi Jinks, all of Washington Court House; seven grandchildren, David Jinks, Kevin (Sherry) Jinks, Amy (Chris) Martinez, Stacey Jinks, Stephanie Jinks, John McCoppin and Steven (Katie) McCoppin; one great granddaughter, Kelsey Grace Martinez and a sister and brother-in-law, Luberta and Richard Wolf of Washington Court House. In keeping with his wishes, cremation took place. A memorial service will be held Saturday, March 9, 2019, at 6 p.m. at the Grace United Methodist Church with Mell Wickensimer, director of visitation at the church, officiating. A time of food and fellowship in the church’s fellowship hall will follow the service. Burial will be at a later date in Washington Cemetery. Memorial contributions may be made to the Grace United Methodist Church, 301 East Market Street, Washington Court House, Ohio 43160. SMSgt. John M. Litten, 87, of Washington Court House, passed into life eternal Sunday, March 3, 2019, at 5:40 p.m. at his home. John was born April 3, 1931, in Jockey Hollow near Flushing, Ohio to Carl “Bus” and Mary Elizabeth Clements Litten. After graduating from Flushing High School in 1949, John joined the United States Air Force in 1951. His basic training was at Sampson Air Force Base in New York and his aircraft maintenance school was at Shepard AFB in Texas. His first permanent assignment was to Furstenfeldbruck, Germany with TDYs to Bremen. There he became a flight engineer. On returning home in 1955, and reenlisting, he was assigned to Wright Patterson Air Force Base as a flight engineer. While there he met and, in 1957, married Alma M. Myers. His next assignment was in 1959 to Ashiya, Japan. White at Ashiya AFB, John served as dock chief and organized the first C-130 maintenance dock. This earned him his Airman of the Year award—the first of many accolades. He then was assigned to Tinker AFB in Oklahoma. From there he went to Scott AFB in Illinois where he was promoted to T/Sgt and because of his performance there he was awarded the USAF letter of commendation. In 1964, he was assigned to Ramstein, Germany where he served as NCO in charge of quality control. He also was on the IG team that inspected other bases in Europe. He was promoted to Master Sergeant and also received the first of his three USAF commendation medals due to several outstanding achievement. In 1968, he was assigned to Phu Cat Vietnam, where he was NCO in charge of maintenance control, working directly under the officer in charge. He was responsible for all of the base maintenance by making sure all of the planes were ready for flight. He again served on the IG team inspecting bases in Vietnam and Thailand. Because of his outstand work, he received his second USFA commendation medal. His final assignment was at Lockbourne AFB where he retired in 1972. There he earned his third USAF commendation medal. After retirement John worked at Bank 1 in Circleville. Then he worked at RCA ten years before he retired again. John loved traveling. While serving at Ramstein, John took his family on trips throughout Europe and England. After retiring from RCA, he and his wife made many trips to Europe and throughout the United States. John made friends that lasted his lifetime. He loved God, his family, friends and country. He was preceded in death by his beloved son, William Lance Litten in 2013; his sister, Phyllis Litten Nichols; two brothers, Kenneth and Arthur Litten and a brother-in-law, Loren Skeen. John is survived by his wife, the former Alma M. Myers whom he married May 4, 1957; a daughter, Karen Litten Grim of Salt Lake City, Utah; two grandchildren, Kristina (Ethan) Grim and Alexander Grim; four brothers, Robert David (Beryl) Litten and Albuquerque, NM, Larry (Leona) Litten and Gerald (Gerry) Litten all of Fairborn, OH and Carl Steven Litten of Phoenix, AZ; three sisters, Vivian Skeen of Canton, Ohio, Sandra (Larry) Gunckel of Greenville, OH and Kathleen Mellott of Lakeland, FL; a brother-in-law, Robert Nichols of TN and several nieces and nephews. The funeral will Friday, March 8, 2019, at 12 Noon at the Warren Funeral Home in Flushing, Ohio with Mell Wickensimer, director of visitation at the Grace United Methodist Church, officiating. Burial will follow in the Rock Hill Cemetery near Flushing. Friends may call at the Kirkpatrick Funeral Home in Washington Court House on Wednesday from 4-7 p.m. and again at the Warren Funeral Home one hour prior to the service on Friday. Memorial contributions may be made to Ohio’s Hospice of Fayette County, 222 North Oakland Avenue, Washington Court House, Ohio 43160 or Arthur G. James Cancer Hospital at The Ohio State University Wexner Medical Center, 460 West Tenth Avenue, Columbus, Ohio 43210. 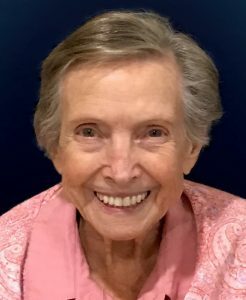 Delores Catherine Meinert, age 94, known to her friends as “Tootie”, passed away peacefully on Sunday, March 3, 2019, at St. Catherine’s Manor of Washington Court House where she had been a patient two weeks. She was born in Davenport, Iowa on July 24, 1924, the daughter of Wendlin (Ben) and Gladys Mengel. She was raised by her stepmother, Delocia Mengel, and told stories about the Mengel Meat Market at 4th and Marquette Streets in Davenport that her father owned. She met the love of her life, Walter T. Meinert at a dance where his dress white Navy uniform caught her attention and they were married shortly thereafter on October 24, 1946. They moved to the Western Hills area of Cincinnati in 1948, when Walter joined Emery Industries Chemical Company. Tootie managed an active household with three children and a husband who traveled the world for work. She could whip up a four-course dinner for visiting executives from other countries at the drop of a hat and she proudly kept a pantry stocked for such occasions. Her signature dinner party included a standing rib roast, Ceasar salad, green beans, potatoes, and a homemade pie. She made the best pie crust in the world and she loved using fresh fruit in her pies. Tootie was a Girl Scout Leader, a Boy Scout Den Mother, PTA volunteer, and an avid bridge player, tennis partner, and golfer. She started the Western Hills Ladies Bridge Club and was a longtime member of the ladies golf league at Hidden Valley golf course in Indiana. Tootie was a proud member of the Westwood Women’s Club and the Cincinnati Woman’s Club, where she took photography classes and exhibited many of her prize photos. She was most proud of having purchased a time share in Tennessee without consulting her husband first, a story she loved telling. She felt lucky to travel frequently and accompanied Walt on many trips to Europe over the years. She was proud of her children and grandchildren and took an active interest in their lives. Walt died in 2007, but she is survived by her children, Susan (Patrick Clancy, deceased), Lawrence (Georgia Yuan), and Walter Jr, (Robin), and grandchildren Kimberley, James, Zachary (Tiffany), and Megan. We will miss her competitive game playing spirit, her love of shrimp cocktails on the screened in porch overlooking the shore, her fashion sense that often included hats, sparkly clothing, and matching shoes, and her love of life. A private visitation and service will be held at Parkview Chapel, Rest Haven Memorial Park, 10209 Plainfield Road, Blue Ash, Oh 45242 Friday, March 15, 2019, from 1:00 pm to 2:30 pm. Arrangements are under the direction of the Kirkpatrick Funeral Home in Washington Court House, Ohio. Brian Keith Nichols, 62, of Lancaster, Ohio, died Monday, February 25, 2019, at 12:13 a.m. at his home. He had been in failing health. Brian was born January 7, 1957, at Wilmington in Clinton County, Ohio to Roy Roger and Sara Ann (Sally) Hamilton Nichols. He was a 1975 graduate of Washington Senior High School and received a bachelor’s of art degree from Ohio Christian College. He lived many years in Chillicothe before moving to Lancaster two years ago. He was an alcohol and drug rehabilitation counselor. He is survived by his mother, Sara (Sally) Hamilton Dews of Chillicothe; a sister, Brenda Monahan of Washington Court House; his former wife, Diana Willett of Chillicothe and a step sister, Deidre (Dee Dews) Justice of Westerville. Arrangements were under the direction of the Kirkpatrick Funeral Home in Washington Court House. Shirley I. Ferneau, 103, of Washington Court House died Wednesday, February 27, 2019, at 5:08 a.m. at Court House Manor where she had been residing since September 2017. Mrs. Ferneau was born January 4, 1916, at Buford in Highland County, Ohio to William and Minnie Moberly Rosselott. She moved to Washington C.H. in 1950 from Greenfield. She worked at the Greenfield Shoe Factory and National Cash Register for many years and retired, at the age of 70, from the Fayette County Clerk of Courts office. Her hobbies were reading, crocheting and, for many years, ballroom dancing. She was preceded in death by her parents; her husbands, Edwin E. Wolfe and Richard Ferneau; a brother, Joseph H. Rosselott; two sisters, Norma M. Achor and Frances Quigley; three nieces, Mary Frances Quigley, Ruth Ann Derbyshire and Anna Louise Osborn and two nephews, Billy Dale Achor and Kenneth Rosselott. Mrs. Ferneau is survived by a niece, Deborah (Alan) Hertlein of Lynchburg; two nephews, Leonard (Kim) Rosselott of Wilmington and Billy Gene (Peggy) Rosselott of Lynchburg; great nieces and nephews and several special friends. In accordance with Mrs. Ferneau’s wishes, her body will be cremated. There will be no visitation or service. Burial of the cremains will be at a later date in Buford Cemetery. 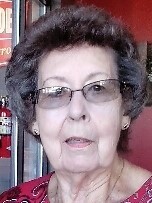 Wilma Margene Ashbaugh, 91, of Washington Court House, Ohio died Tuesday, February 26, 2019, at 4:58 p.m. at Court House Manor Nursing Home where she had been a resident since February 10, 2019. Wilma was born September 9, 1927, in Lebanon, Ohio to William McKinley and Irma Velma Lucas Peacock. She was a 1945 graduate of Washington High School and lived most of her life in this community except for a short time in Miami, FL. Before her retirement, she was a 25-year employee of the General Electric Lamp Plant in Circleville. Following her retirement, she served as a night auditor at the Knights Inn in Washington Court House. She had also formerly worked at Carpenter’s Hardware in Washington Court House. Wilma had been a member of the former First Christian Church and currently was attending the State Route 38 Church of Christ. She enjoyed traveling and going to casinos. She was an avid reader with Louis L’Amour being her favorite author. On May 14, 1945, she married Norman Gerald Ashbaugh. He preceded her in death on November 3, 1992. She was also preceded by her parents; a son-in-law, Stephen Radabaugh; brother, Arthur L. Peacock; brother-in-law and sister-in-law, Ralph and Wanda Ashbaugh and a sister-in-law and brother-in-law, Mary Eleanor and Robert Huff. She is survived by a son and daughter-in-law, Donald Lee and Jacqueline Ashbaugh of Midland, OH; a daughter, Rita Faye Radabaugh of Circleville; five grandchildren, Brian L. (Melissa) Ashbaugh, Brandi (Brian) Deitrich, Tony (Debbie) Earley, Shawn Munyon and Michael (Michelle) Munyon; several great grandchildren including, Summer, Sydnie, Grayson and Connor Munyon, Tyler Earley, Erica and Mason Deitrich; a step granddaughter, Shirley Hummer; two step great grandchildren, Addison and Cameron; a sister, Lois Olds of Wisconsin and a sister-in-law, Patricia Peacock of Virginia Beach, VA. The funeral will be Friday, March 1, 2019, at 1:30 p.m. at the Kirkpatrick Funeral Home in Washington Court House with Steve D. Henderson officiating. Burial will follow in the Good Hope Cemetery. Friends may call at the funeral home from 12 noon Friday until time of the service. Memorial contributions may be made to Heartland Hospice, P.O. Box 10086, Toledo, Ohio 43633-0086 or a charity of the donor’s choice.